Treating tumors in children is challenging, but innovative technologies are enabling faster recovery times and better outcomes than were possible even a few years ago. Intraoperative MRI (iMRI) – For patients with central nervous system tumors, iMRI provides neurosurgeons real-time visualization during surgery. With an iMRI, neurosurgeons remove the tumor, then acquire additional MRI images while the patient is still asleep. Using computer guidance along with iMRI, neurosurgeons can remove all the tumor that is safely accessible. This device is a major advance in the surgical treatment of pediatric brain tumors. Robotic Surgical Assistant (ROSA) – A new generation of robotic neurosurgery technology enables the safest possible surgery in the shortest amount of time. Available only at the nation's most advanced medical centers, ROSA's navigation helps surgeons target tumors more precisely and less invasively. MRI-guided Laser Heat Ablation (MLA) – A minimally invasive neurosurgical procedure, MLA is FDA-approved and currently available for some pediatric patients as an alternative to conventional open surgery. MLA provides hope for patients with otherwise inoperable brain tumors, and has the potential to enhance other therapies making the tumor more accessible to administered medications. Proton Therapy – Proton therapy can be the optimal treatment for certain pediatric brain tumors. It allows for precise, targeted radiation treatment with less radiation to surrounding normal, healthy tissue, which is important in minimizing long-term side effects and preserving function. Gamma Knife© – For children with small inoperable brain tumors, Gamma Knife© is a state-of-the-art type of stereotactic radiosurgery. A minimally invasive treatment option, the Gamma Knife© allows children to receive ultra-precise amounts of radiation in specifically targeted areas of the brain, limiting radiation dose to the surrounding normal tissue. Developmental Therapeutics – The rapid advancement of science is bringing new treatments to the battle against brain tumors all the time. These treatments are available through clinical trials programs and encompass a range of approaches including drugs and immunotherapies that are tailored to an individual's tumor. Only a handful of programs nationwide have the experience and the infrastructure necessary to safely and effectively deliver these innovative therapies to patients. Siteman Kids at St. Louis Children's Hospital is one of only a few pediatric hospitals in the country to offer all these technologies for young and adolescent cancer patients. Combining the expertise of St. Louis Children's Hospital, Siteman Cancer Center and Washington University Physicians, Siteman Kids at St. Louis Children's Hospital is ranked among the best pediatric cancer hospitals in the nation by U.S. News & World Report and is among only 7 percent of U.S. hospitals to receive a Magnet designation, the highest honor for nursing excellence, from the American Nurses Credentialing Center. Siteman Cancer Center, ranked among the top cancer treatment centers by U.S. News & World Report, has received an "exceptional" rating from the National Cancer Institute (NCI) -- the highest rating possible. The physicians at the Washington University School of Medicine, ranked among the best medical schools in the country, include national leaders in childhood cancer research and cancer care. Founded in 1879, St. Louis Children's Hospital is a member of BJC HealthCare. For more information, visit StLouisChildrens.org, or find us on Facebook and @STLChildrens on Twitter. 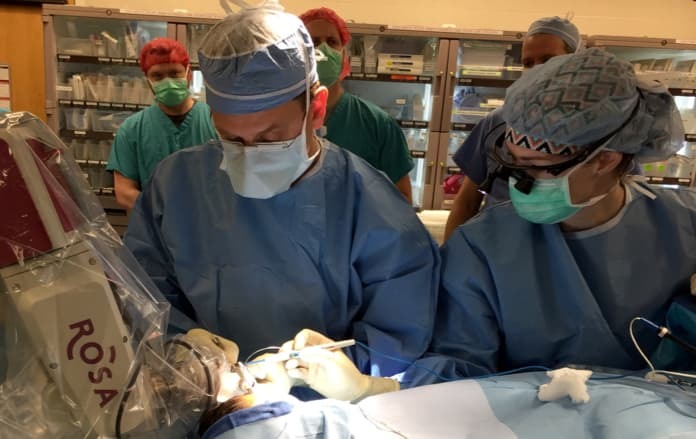 Robotic Surgical Assistant (ROSA), a new generation of robotic neurosurgery technology, provides a 3D image of the brain in real time so surgeons can reach a tumor while bypassing critical areas of the brain. Minimally invasive procedures such as this can reduce patient recovery time substantially.